Since the start of the armed conflict in Syria in 2011, voices from Western and Gulf capitals have maintained a common narrative: that the Assad regime lacks popular legitimacy and stays in power by systematically killing its own people. The sweeping election victory of Bashar Assad not only shows the depth and breadth of popular support for his government, but also it demands an objective interpretation of events inside Syria. In the midst of a civil war that has seen rebel militia groups and foreign Islamist fighters occupy areas of territory around the country, polling for the recent elections was held only in government-controlled areas. 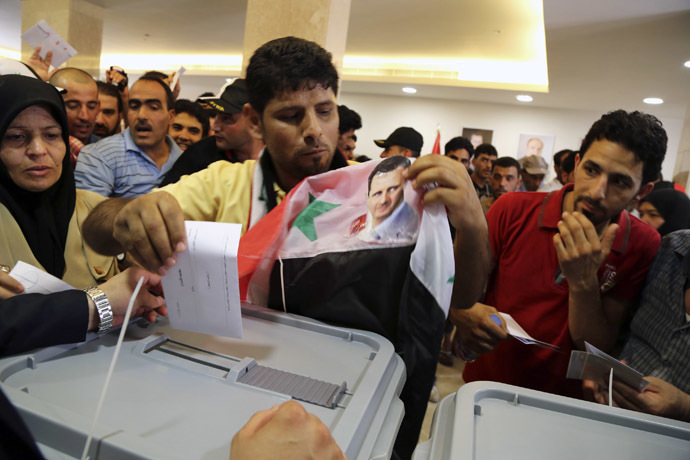 Assad ran against two challengers and won with 88.7 percent, garnering 10,319,723 votes. 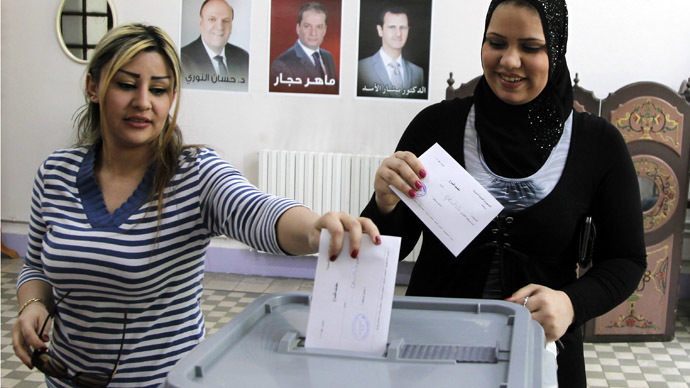 According to Syria’s supreme constitutional court, 73.42 percent of some 15.8 million eligible voters took part in the elections. There are many reasons to explain why Assad – though internationally condemned and characterized as a dictator – is able to conjure up mass support at the ballot box. After three years of brutal fighting that has left many areas of the country devastated, Assad is seen as the only figure that can stabilize the country and ensure a stable, secular rule that respects all minority communities. Assad entered office in 2000 as a reformer, and is credited with ushering in economic reforms that boosted consumer spending, increased tourism, and emboldened the private sector; his government is also highly regarded for providing free education and healthcare, while heavily subsidizing other public services. Although the fighting in Syria is known to have a sectarian dimension, Syrian society has been regarded as highly tolerant and fair towards a multitude of religious and ethnic groups, such as the Christian, Alawite, Druze and Kurdish minorities, and the majority Sunni Muslims. The recent election results are to a testament to how Assad – who belongs to the Alawite sect of Shia Islam – can still command huge support from the Sunni majority. There are undoubtedly many Syrians who would like to see greater political pluralism in the country, including expatriates who returned to Syria to cast their vote, but even many of these people voted for Assad because they distrust the opposition. Syria’s opposition groups and parties that are opposed to Assad can be put into three categories. The first are the domestic non-parliamentary opposition groups represented by the National Coordination Committee for Democratic Change (NCC), which opposes foreign involvement in Syria’s war and supports non-violent resistance and negotiations with the government. This umbrella group consists of mostly left-leaning parties and independent activists, and is a representation of genuine grassroots opposition to Assad’s rule. The organization called for a ceasefire agreement before elections and boycotted the polls. The second are the hundreds of disparate rebel groups and Islamic militant organizations fighting the Syrian army, which include the Islamic State of Iraq and the Levant (ISIL), the Al-Nusra Front, the Harakat Sham Al-Islam, and other organizations with ties to Al-Qaeda. Though these groups are often opposed to other rebel militia groups and are marred by infighting, they command the strongest presence on the battlefield and are heavily reliant on foreign fighters from all corners of the world. ISIL has a large presence in the in northern regions such as Ar-Raqqa, Idlib and Aleppo. These groups target minority groups such as Alawites and others suspected of supporting Assad, and mete out brutal abuses and targeted killings that include beheadings, dismemberment, and crucifixions. Women and children are not spared from these horrific acts. These organizations are said to be receiving support from Saudi Arabia, Turkey and Qatar. The third opposition force is the Syrian National Council (SNC), an umbrella organization based in Istanbul comprised of exiled pro-Western dissidents. The SNC represents a negligible segment of rebel groups on the ground, and is not seen as credible inside Syria. Members of the SNC claim to support moderation, human rights, press freedom and democracy. The organization receives tremendous financial and diplomatic backing from the United States and other Western and Gulf countries, and is the main component party of the Syrian Opposition Council. The military affiliate of the SNC, the Free Syrian Army (FSA), consists of personnel that have defected from the army, and other volunteers. The group’s influence is severely outflanked by Islamist militias. Washington regards the FSA as moderate, although it fights alongside the Islamic Front and other Islamist groups that are arguably less-than-moderate. The irony of John Kerry’s statement is that the US, along with authorities in Turkey, Germany, France and other Gulf states effectively banned Syrian refugees from voting at Syrian embassies, forcing many to return to the country to exercise their rights. The opponents of Assad didn’t hide the fact that they prevented Syrians from participating in these elections. The criterion for Western and Gulf states deciding whether or not an election or referendum is legitimate depends entirely on political considerations. The United States and its European allies enthusiastically supported recent elections in Ukraine, which took place while the government launched military operations against rebellious provinces in the east, whose citizens did not take part in the vote. In Ukraine, billionaire politician Petro Poroshenko, who supports aligning the country closer to the European Union and the United States, won with 54.7 percent of the vote, while some 60.9 percent of eligible voters participated. Despite holding elections under similar conditions, the Western countries quickly congratulated Poroshenko’s victory, but condemned Assad’s victory, despite a higher percentage of public participation in Syria’s polls. The double standards couldn’t be clearer. Syria’s polls should be viewed not only as a public referendum on Assad, but also on the actions taken by the Syrian armed forces. Any government has a legal and political responsibility to maintain control of territory, especially when it comes under control of non-state actors and terrorist elements. The fighting in Syria is not a civil war, but a full-blown international conflict with arms and financing being meted by various intelligence agencies and state actors who want to see regime change in Damascus. The results of the polls demonstrate that the Syrian population rejects foreign interference and stands with the democratically elected government. Despite the clear majority support that Assad enjoys, the Obama administration is ramping up efforts to aid Syrian rebel groups with a $27 million aid package, and by granting formal diplomatic mission status to the Syrian Opposition Council’s offices inside the US. While Western countries shed crocodile tears over the dead in Syria, their policies further prolongs the conflict and endangers more civilian lives. The armed opposition isn’t winning on the battlefield, and they do not have popular support. At the current juncture, Washington and its allies treat the unelected exiled dissidents that make up the SNC as the legitimate representatives of the Syrian people, despite the fact that these people could never unseat Assad at the ballot box. They only represent themselves. Countries that take a neutral position on the Syrian issue should recognize the extent of popular support that Assad enjoys, and call for an end to the conflict through immediately ending the flow of arms and finances to non-state actors and terrorist groups operating in Syria. Over 150,000 people are said to have been killed in Syria; the country’s GDP has nearly fallen by half; nearly half the population lives in poverty; millions of refugees have been displaced; nearly half the population is unemployed, while public services such as schools and hospitals have operated sporadically throughout the ongoing fighting. The people of Syria have put their trust in Bashar Assad to end the fighting and stabilize the country, and the continuation of regime change policies from Western and Gulf capitals amounts to legitimizing terrorism to overthrow a popular and democratically legitimate government. Those haranguing scowls will continue to blare from Western and Gulf capitals, perched on a moral high ground that has collapsed and given way under the landslide of a sovereign people’s choice. The people of Syria have taken back their name, and those in the West can only claim to speak for them in as much as a bullet can claim to speak for its target.